The story begins in June 2015 when Miro (the owner) officially found Tailor Lamb in Sofia, Bulgaria. He now has a small, lean business with lovely customer support and is passionate about it. Tailor Lamb is not here to reinvent the wheel. They want to provide you with high quality custom shirts for a good price. They achieve that by working with reputable mills such as the Albini Group and Canclini. Italians have generally a very good reputation when it comes to sourcing materials. Why would you choose them instead of everybody else then? A unique and very appealing sell point for me is the fact that Tailor Lamb supports charity. Coming from a country with low minimum wage I can relate to this. Specifically, Tailor Lamb has partnered with a foundation called “Teach For All” that exists in many countries around the world locally. In a nutshell, their goal is to provide education to children without access to schools or quality teaching. For every shirt you purchase from Tailor Lamb, an amount goes to “Teach For Bulgaria“. This means that one child gets the chance to receive quality education for a whole week. Did you know that nearly half of all young people in Bulgaria cannot interpret the meaning of what they read? Think about it. It is a very noble cause and it is also great to see companies that try and make a difference. Customizing your Tailor Lamb shirt is easy. You get to choose from a nice amount of designs and weaves, all neatly separated in categories. After you choose one, you can begin customizing it. There is a plethora of options! You can choose between 14 collar types that all have different code names. You can visually distinguish between the different types, but I would like to see a small explanation for them. Is this a cut-away, or extreme spread collar? 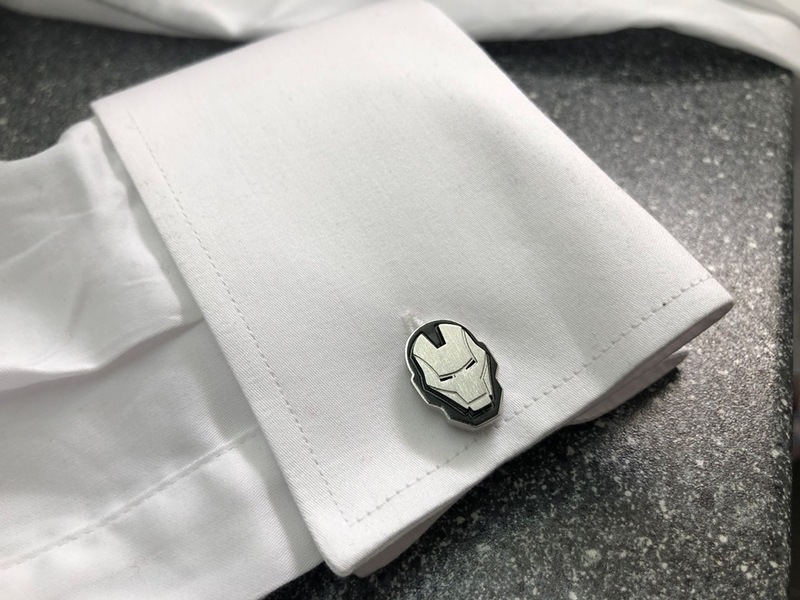 For cuffs there are 6 options including french, single and double button cuffs. One can even choose pockets (for more casual shirts), pleats and the design of the placket. Lastly, before inputting your measurements, you can add a monogram in 5 different places. The limit is 3 letters. If you go back to our Essential Formal Shirts article, a plain white shirt is the king of formality and versatility. Ironically, it was something my wardrobe was lacking until now. That is because I did not want to compromise in quality and design. Pretty straightforward and very classic! Putting on my serious face for this! Now that you have designed your shirt, it is time to get to the “scariest” part of an online MTM Service: The measurements. To begin with, if you shirt does not fit, you can make a free alternation request for the first time. Or you can also ask for a refund if you do not like it within 60 days of purchase. To ensure this does not happen, Tailor Lamb offers 3 ways to measure yourself. This option is for the more experienced people, or those that know exactly how they want their shirts to fit. Maybe you want a little more space on the back, or your armpits tend to have holes. You give 9 different measurements and proceed to check out. If you are new to this, I would advise using one of the other 2 methods. Another alternative is to measure your own body. You answer the same 9 questions as before, only this time you use a measuring tape. Additionally, you get to choose the fit (Regular/Slim/Extra Slim). As soon as you enter your values, you will get a table with the suggested values. If you want, you can still make alterations. The only downside to this method is that you need a second person to help you and it can be more prone to error than the next one. The last method is the one I chose and by far my favorite. 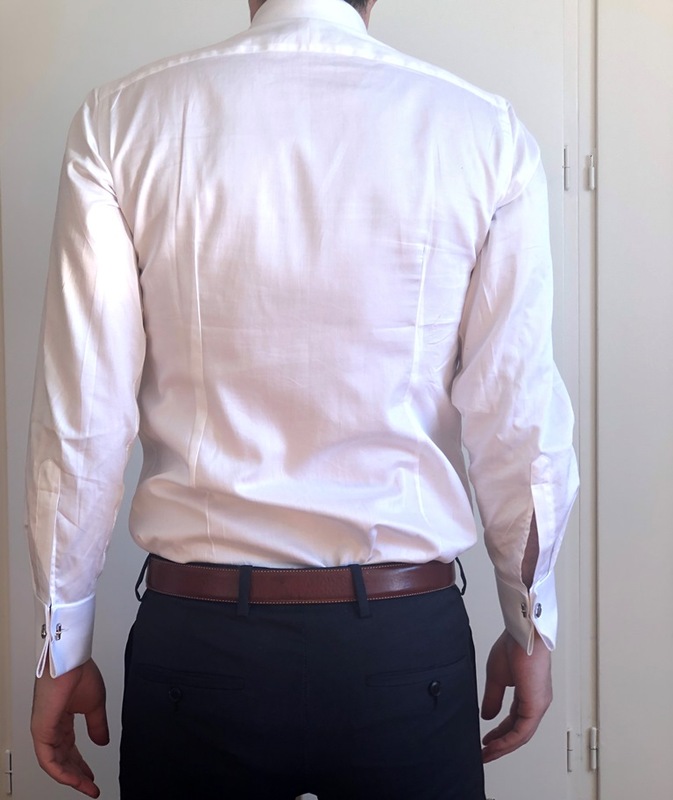 If you have a shirt that fits great, you can measure it and input those values. Following the visual guide is easy and straightforward. Not only that, but you can also add or remove half an inch for example from a particular area. Say that there are often holes in your armpits, so you add an inch of extra space there. For me this is the best and most effective method and it worked very well as you will see later on. If you want to go into more detail, here is Tailor Lamb’s Guide on measuring your Body or a Shirt. Unboxing is slowly becoming one of my favorite activities! 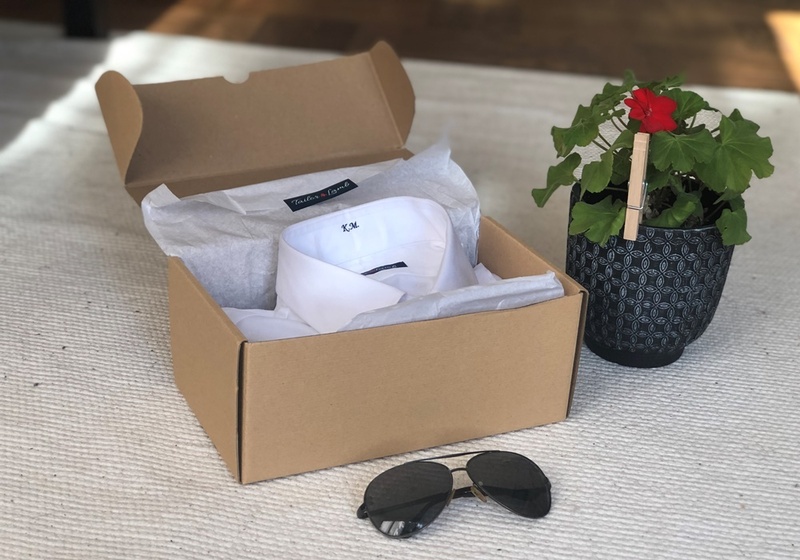 Tailor Lamb shirts will arrive at your door in about 3 weeks which is typical for a custom shirt. My order took 20 days to arrive. More on shipment here. The packaging is simple, but extremely nice in my opinion. A small, tidy box from recyclable paper and a reminder of Tailor Lamb’s charity cause. It makes me feel good to know that I am helping someone out there. Inside, the shirt is wrapped in thin paper and a protective plastic layer. Generally, I would probably expect a little bit more such as return details or a small thank you note. However, given that Tailor Lamb cares about the environment and sustainability by using ecological cardboard, I am very happy the way it is. As always, the first thing to do is take a quick look at the shirt for problems or quality issues. I am happy to report that my shirt arrived in perfect condition and ready to wear. It was also a nice moment to see my initials on the back of the collar! It feels a little special to know that this is something just for you and nobody else. There were no issues with the stitching either and the buttons seemed robust. Now, you know that all companies preach high quality. Very often that is not the case, or not up to those high standards. 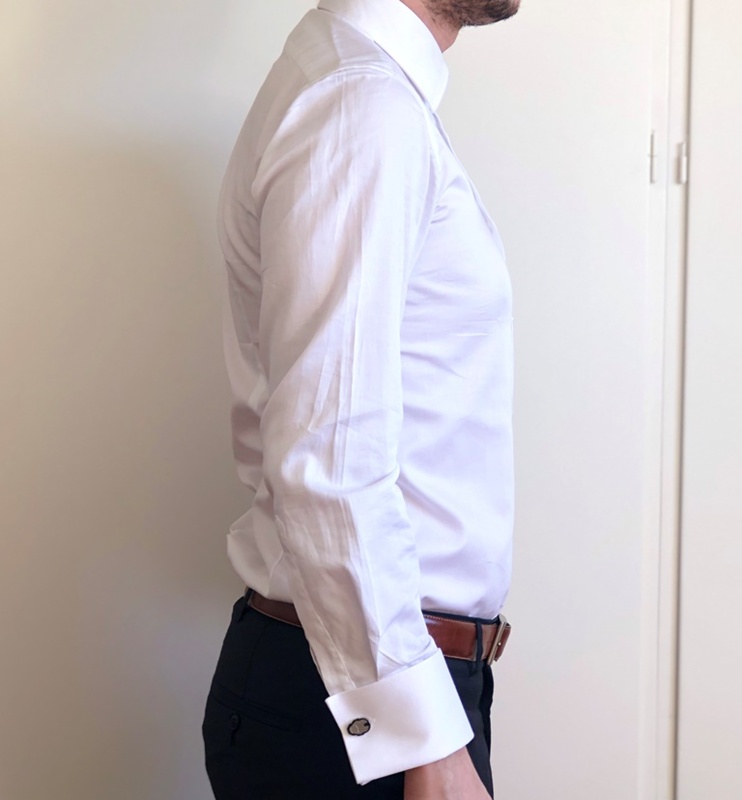 However, I am happy to report that my shirt from Tailor Lamb is very good. 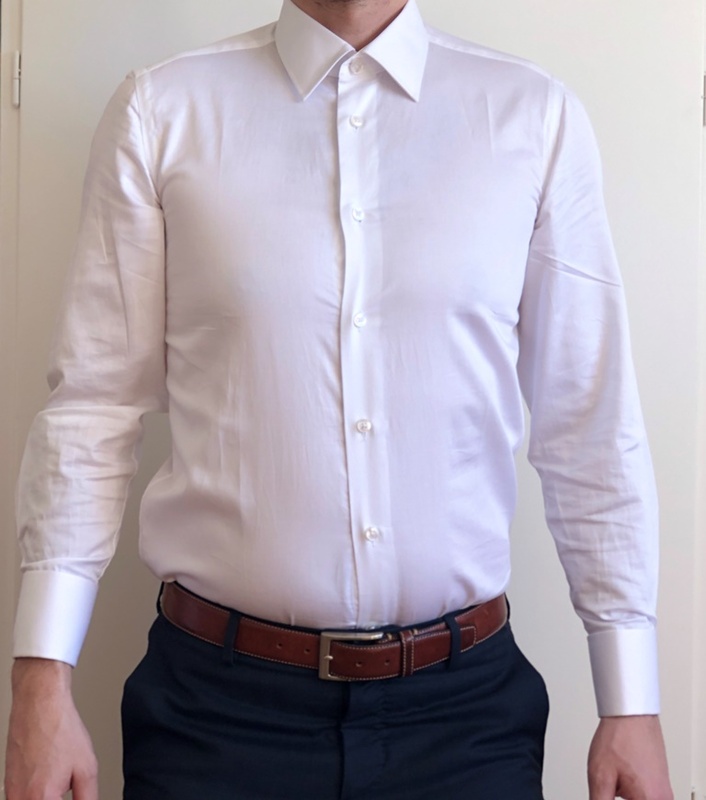 I have a very expensive, high quality shirt from ETON and apart from some superior construction details (built in collar stays) I could not tell the difference. A second opinion by Ms. Misiu that confirmed it. The stitching is about 7 SPI (Stitches Per Inch) compared to the typical 5-6 SPI on my other shirts. It is a good first indicator of quality in my opinion. Very consistent over the whole shirt with the exception of buttonholes. The stitching seems to be done by machine but is a little sloppy with threads loose here and there. One more improvement would be the possibility to add brass collar stays instead of plastic. They just seem a little sturdier in my opinion. All in all, this is what I would expect if I paid $115 for a shirt. Taking the price into account, I would be happy giving Tailor Lamb a 8/10 here. 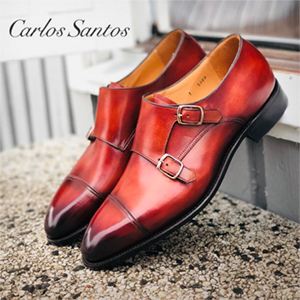 The most important aspect of any cloth or shoe is the fit. We have been strong supporters of this here in Misiu Academy since the first ever post! I actually thought I would have to send back the shirt for a small fix here and there or simply take it to my tailor. I quickly realized however that the shirt fits really good! Better than I could ask for. Here is the front view first. The sleeves have the correct length, it is long enough to stay in my pants when I stretch and the collar is fantastic. On the side, you can see a tad excess fabric but it is normal when I have to take my own photos. Lastly, the same applies to the back. I could have tucked it in better though! Pretty good on the back too. I address the cuff size down below. 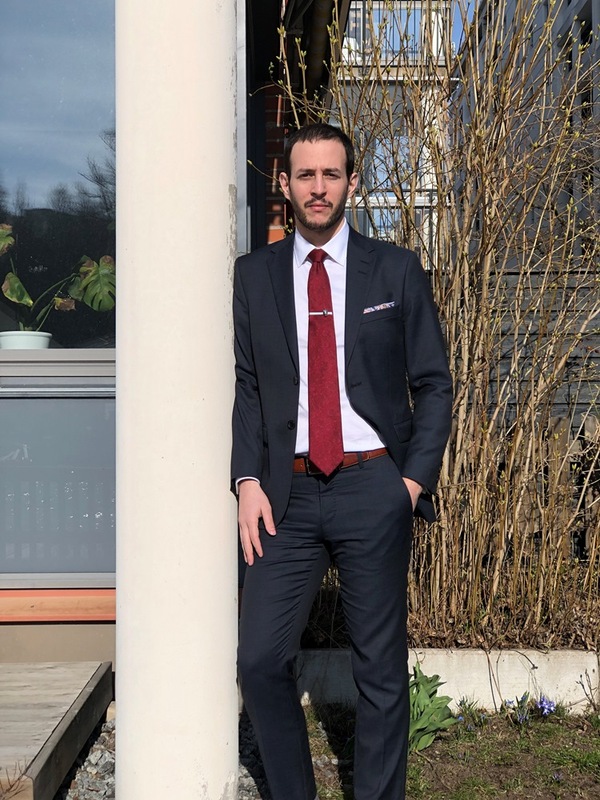 I usually have a small problem with collars being too tight when I wear a tie, but this is different. Very comfortable with just enough space for a finger when buttoned up. The only thing I could potentially alter is the french cuffs. I would probably add half an inch more to have space for my watch. It is quite tight at the moment, but then again I do not like wearing that dreadful Vincero. The Orient Bambino cannot come too soon! I am proud to give Tailor Lamb a 9.5/10 in fit. Important: Please, remember that this is my own experience. Maybe I got lucky but be weary you might have to alter something. As you can see the algorithm suggested half an inch decrease in a few areas, which turned out to be spot on! In a follow up discussion with Tailor Lamb, I provided again my chest measurements and waist. This because I put the half values instead when they ask for full.. What this shows is that they care about details and if something seems wrong, they will let you know! It is time to talk about the price. This shirt would cost you $115 (1070 SEK/€102/£88) including VAT. This is automatically subtracted if you are outside the EU. Shipment is free for orders over $150 otherwise have a $15 flat fee. The cost depends on the fabric and style but expect to pay between $100-150. 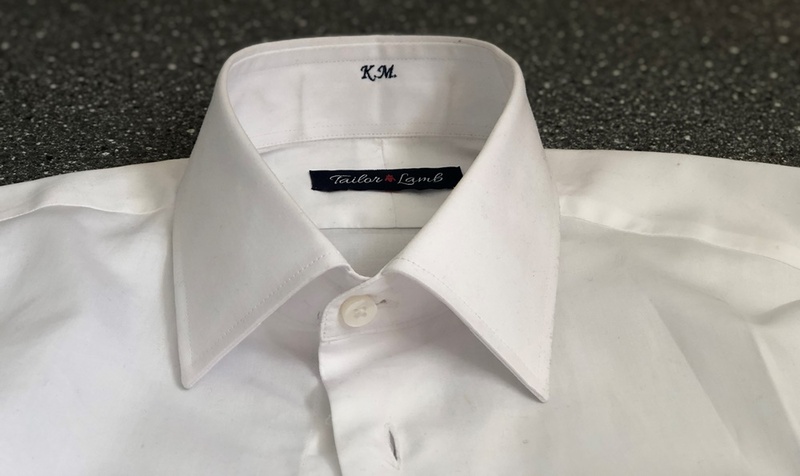 While this is not enough to put Tailor Lamb in the High Luxury Shirt category, it is still a premium price for many people. However, a great shirt with a price I am willing to pay and perfect fit (for me!) makes it good value. If you buy more than one, the value increases even more since you avoid the shipping costs. If I may speak for myself, I am also willing to pay this price and help illiterate children. So if you are struggling and have a low budget, Tailor Lamb and MTM online services are probably not for you. On the other hand, if you want that one perfect shirt but cannot afford bespoke yet, custom shirts are great value. If you are in this category, I can absolutely recommend Tailor Lamb to you. To put things in perspective, my ETON shirt is RTW and costs $190. 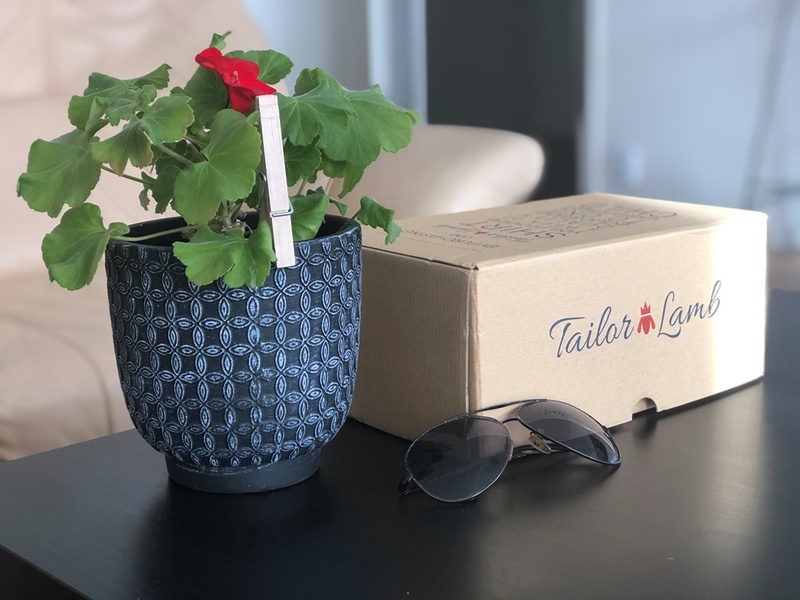 Tailor Lamb was kind enough to provide Misiu Academy readers with a special discount code! Use DISK0401 during checkout for a 20% discount! The offer is valid until 30/06/2019. Thinking about my collaboration with Tailor Lamb, I am happy I took this opportunity. I am a huge fan of the cause and small businesses from generally poorer countries. These create jobs and opportunities for families to make a living and in return, you get a superb shirt. 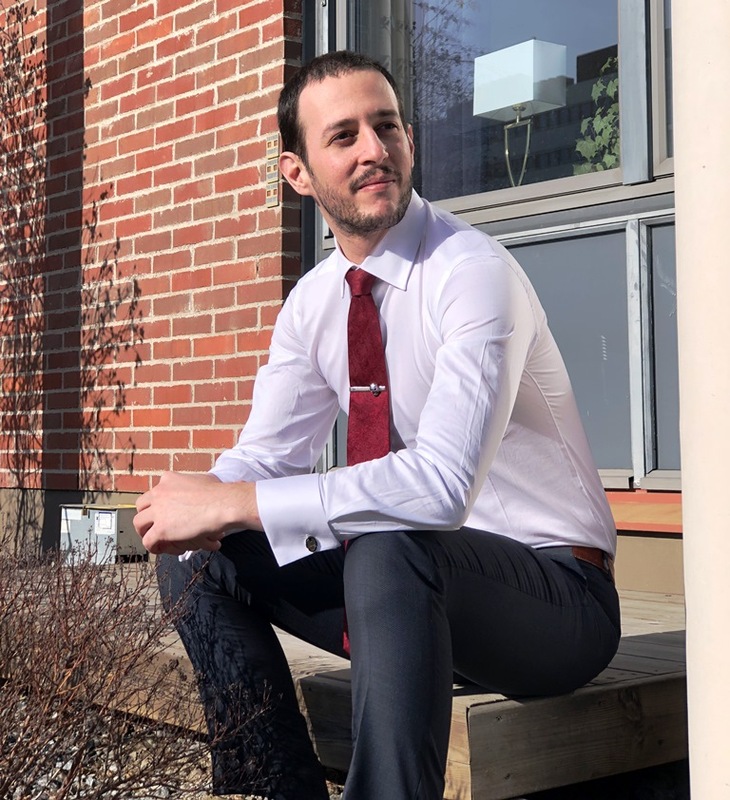 Smiling because spring is here and the shirt fits great! With great construction, stitching, fabric quality and above all, excellent fit I know I will be a returning customer. I personally want to thank Miro and Ralitsa (Customer Service) for their excellent communication and reaching out to me. If you have questions, they are very responsive on Instagram. This brings the “Tailor Lamb Review” article to a close and I can say I enjoyed it very much! Let us know what you think in the comments down below. Stay tuned for the next weeks because we will be reviewing some incredible shoes.